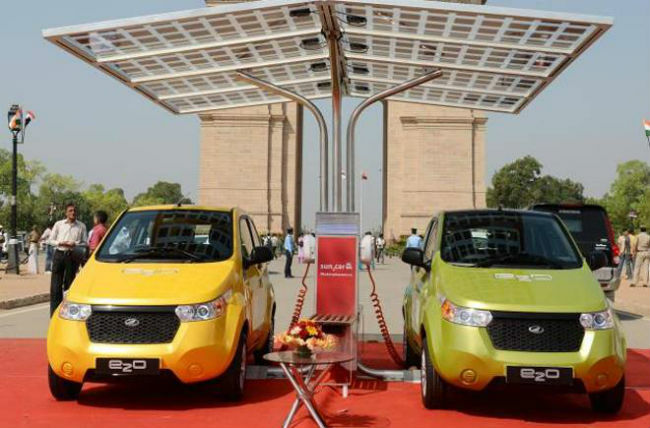 According to Mahindra & Mahindra (M&M), the running cost of their newly rolled out electric car ‘e2o’ will be as low as 50 paise per kilometer (km). Hard to believe, but this new car neither runs on diesel or petrol and nor does it have any conventionally loaded engine. This truth comes from Mahindra’s stable that their brand new electric car Reva e2o runs on next generation li-ion battery, which does not require any maintenance and cover up to 100 km on a single charge. After a full charge, it produces top speed of up to 82 km per hour (kmph) and to top it up, it can be charged from a simple home socket. Back in 2004, Mahindra came with the country’s first REVAi and now is back with e2o, the second generation technical breakthrough. According to Mr. Anand Mahindra, Chairperson of M&M Group, it is a world class innovation. Priced at Rs. 5.96 lakhs (on road price), Mahindra Reva e2o shall be in the national capital this Monday. In the beginning, the car will only be available in the 8 major cities of the nation. The company intends to sell around 400 to 500 car units each month in order to maintain a certain level. As per the company’s study, on every 1,200 km car drive you’ll be saving Rs.70,000 on an annual basis. The car promises mega incremental benefits. Apart from being eco-friendly, the running cost will also be as low as 50 paisa per km. However, if we hear what Sumit Arora (Associate Director of Synovate Motorsearch) is saying, then this is not a good time in India for electric cars. As there is lack of charging infrastructure and the power crisis is also still on our heads.